Several weeks ago, after receiving a reader question, I wrote about how to begin keeping a prayer journal. Like anything else, we can have great intentions, but knowing where to start and breaking down a goal to step by step directions propels our intentions into motion. 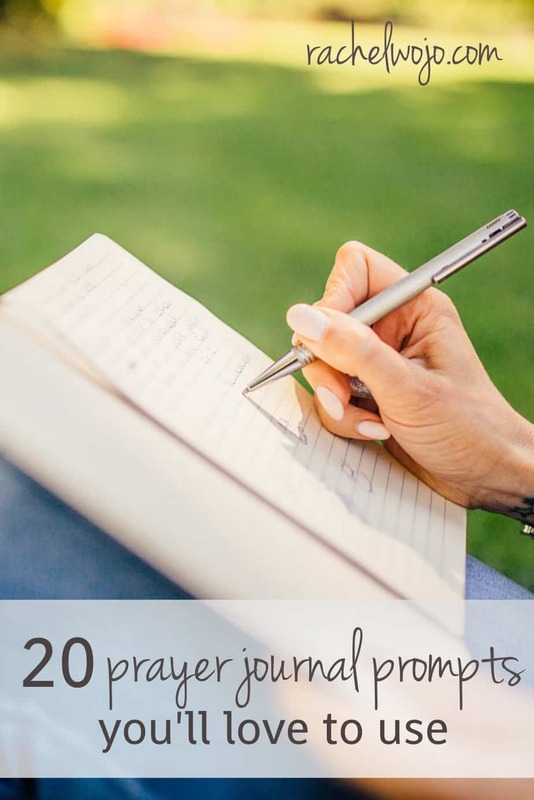 Today I wanted to share 20 prayer journal prompts to follow up on how to begin keeping a prayer journal. Once I started writing out my prayers to God in a journal, I discovered all the benefits and I wanted to write more. But what do you write? Check out these prayer journaling ideas. 1. Rewrite a favorite Scripture in prayer. Highlight the sentences or words of a passage that stand out in your mind and rewrite it back to God. You can see an example of this style in A Prayer to Remember God is Bigger. 2. Write a thank you note for something for which you feel especially blessed. Use words or phrases as if you are talking to your best friend. 3. Write a love letter to God. 4. Tell God how much you love him and praise him for who He is. Hold the prayer as a “praise only” prayer. 5. Write out a list of thanks for everyday things and pray the list to God. When I’m struggling with circumstances outside of my control, this type of prayer works wonders. 6. Copy a meaningful prayer that someone else has written into your prayer journal. The exercise of writing it in your handwriting provides your brain a way to remember the meaning. 7. Write out a prayer of praise for all God has accomplished in your life. Just make a list of the times you’ve seen him work and thank him for it. 8. Write a prayer on behalf of a loved one. Thank God for them and describe your thoughts about this person to God. 9. Surrender all your thoughts to the Lord by writing out a prayer of giving yourself to him. You may want to list things you hold the most dear and hold them up to him with open hands in full trust. 10. Pray a prayer of blessing over someone you love. 12. Take a prayer walk outside and for everything you see, give thanks. Nature gives us much to praise God for. After taking your walk, grab your journal and plop down in a field or on a park bench. Write out words of praise to God for his creation. 13. Use a list of the names of God to write a prayer of thanks for who he is. 14. Use the ch@t guide or one of these 5 ways to keep a prayer journal. 15. Write out a prayer for the “least of these” (Matthew 25:40) and ask God to show you your part in ministering to the homeless, disabled, or the elderly. 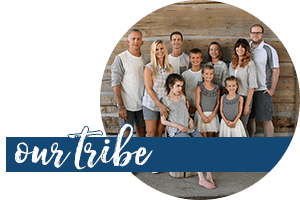 Ask God to specifically show you the special needs you can meet right where you are. 17. List out your priorities or decisions you must make in the next week. Give them to God and ask him to lead you every step of the way. 18. Rewrite your church prayer list needs and pray over them, asking God to meet those needs. 19. Use a journal entry to pray for your local leaders, community, church and business. Write out any specific needs of which you are aware and give them to God. 20. Copy the Lord’s Prayer from Matthew 6:9-13. Then rewrite the prayer using your own words. I think we’ve all said before “I’m not sure what to write.” No matter for what reason. 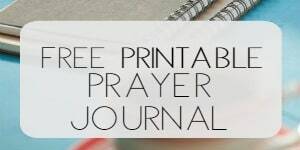 My hope is that you’ll enjoy this list of prayer journal prompts and find yourself with plenty of ideas to write out your prayers to God. Which idea resonates the most with you? 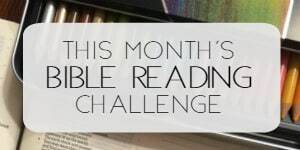 Or do you have a prayer journal prompt you’d like to share? Thank you for the prayer journal prompts; they are all very helpful. You are so very welcome! Enjoy! Thank you so much for these prompts. Sometimes I feel that I have gotten myself in a prayer rut, praying the same things over & over. These prompts offer me a deeper perspective for my prayer time. Again, thank you!